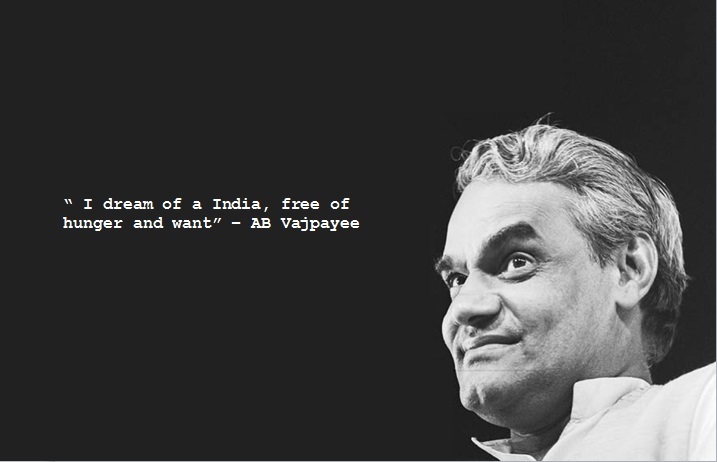 AB Vajpayee was Prime Minister of India from May 16-31, 1996, and then again from March 19, 1998 to May 13, 2004. With his swearing-in as Prime Minister after the parliamentary election of October 1999, he became the first and only person since Jawaharlal Nehru to occupy the office of the Prime Minister of India through three successive Lok Sabhas. 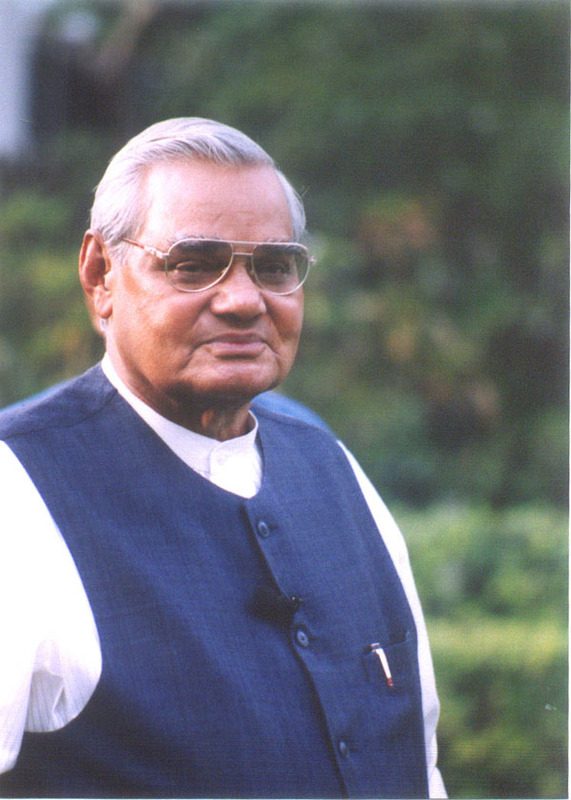 Shri Vajpayee was the first Prime Minister since Smt. Indira Gandhi to lead his party to victory in successive elections. 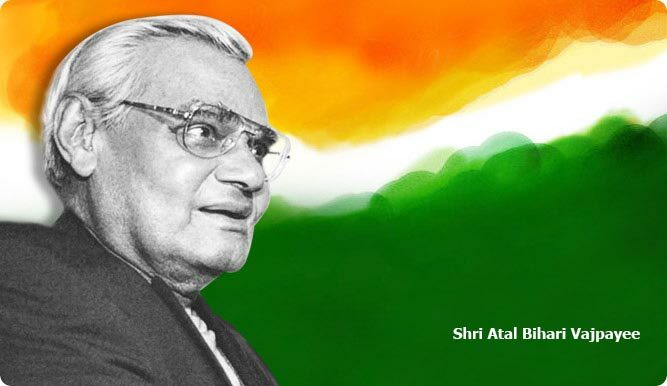 Born on December 25, 1924, in Gwalior, Madhya Pradesh to Shri Krishna Bihari Vajpayee and Smt. Krishna Devi, Shri Vajpayee brings with him a long parliamentary experience spanning over four decades. He has been a Member of Parliament since 1957. He was elected to the 5th, 6th and 7th Lok Sabha and again to the 10th, 11th 12th and 13th Lok Sabha and to Rajya Sabha in 1962 and 1986. In 2004, he was to Parliament from Lucknow in Uttar Pradesh for the fifth time consecutively. He is the only parliamentarian elected from four different States at different times – UP, Gujarat, MP and Delhi. His legacy as Prime Minister is a rich one that is remembered and cherished even a decade after his term ended. It included the Pokhran nuclear tests, astute and wise economic policies that laid the foundations of the longest period of sustained growth in independent Indian history, massive infrastructure projects such as those related to development of national highways and the Golden Quadrilateral. Few Indian Prime Ministers have left such a dramatic impact on society. Educated at Victoria College (now Laxmibai College), Gwalior and DAV College, Kanpur, Uttar Pradesh, Shri Vajpayee holds an M.A (Political Science) degree and has many literary, artistic and scientific accomplishments to his credit. He edited Rashtradharma (a Hindi monthly), Panchjanya (a Hindi weekly) and the dailies Swadesh and Veer Arjun. His published works include “Meri Sansadiya Yatra” (in four volumes), “Meri Ikkyavan Kavitayen”, “Sankalp Kaal”, “Shakti-se-Shanti”, “Four Decades in Parliament” (speeches in three volumes), 1957-95, “Lok Sabha Mein Atalji” (a collection of speeches); Mrityu Ya Hatya”, “Amar Balidan”, “Kaidi Kaviraj Ki Kundalian” (a collection of poems written in jail during Emergency); “New Dimensions of India’s Foreign Policy” (a collection of speeches delivered as External Affairs Minister during 1977-79); “Jan Sangh Aur Mussalman”; “Sansad Mein Teen Dashak” (Hindi) (speeches in Parliament, 1957-1992, three volumes); and “Amar Aag Hai” (a collection of poems, 1994). Founder-member of the erstwhile Jana Sangh (1951), President, Bharatiya Jana Sangh (1968-1973), leader of the Jana Sangh parliamentary party (1955-1977) and a founder-member of the Janata Party (1977-1980), Shri Vajpayee was President, BJP (1980-1986) and the leader of BJP parliamentary party during 1980-1984, 1986 and 1993-1996. He was Leader of the Opposition throughout the term of the 11th Lok Sabha. Earlier, he was India’s External Affairs Minister in the Morarji Desai Government from March 24, 1977 ,to July 28, 1979. Widely respected within the country and abroad as a statesman of the genre of Pt. Jawaharlal Nehru, Shri Vajpayee’s 1998-99 stint as Prime Minister has been characterised as ‘one year of courage of conviction’. It was during this period that India entered a select group of nations following a series of successful nuclear tests at Pokhran in May 1998. The bus journey to Pakistan in February 1999 was widely acclaimed for starting a new era of negotiations to resolve the outstanding problems of the sub-continent. India’s honesty made an impact on the world community. Later, when this gesture of friendship turned out to be a betrayal of faith in Kargil, Shri Vajpayee was also hailed for his successful handling of the situation in repulsing back the intruders from the Indian soil. Shri Vajpayee has served on a number of important Committees of Parliament. He was Chairman, Committee on Government Assurances (1966-67); Chairman, Public Accounts Committee (1967-70); Member, General Purposes Committee (1986); Member, House Committee and Member, Business Advisory Committee, Rajya Sabha (1988-90); Chairman, Committee on Petitions, Rajya Sabha (1990-91); Chairman, Public Accounts Committee, Lok Sabha (1991-93); Chairman, Standing Committee on External Affairs (1993-96). Shri Vajpayee participated in the freedom struggle and went to jail in 1942. He was detained during Emergency in 1975-77. Widely travelled, Shri Vajpayee has been taking a keen interest in international affairs, uplift of Scheduled Castes and Scheduled Tribes, women and child welfare. Some of his travels abroad include visits such as – Member, Parliamentary Goodwill Mission to East Africa, 1965; Parliamentary Delegation to Australia, 1967; European Parliament, 1983; Canada, 1987; Indian delegation to Commonwealth Parliamentary Association meetings held in Canada, 1966 and 1994, Zambia, 1980, Isle of Man 1984, Indian delegation to Inter-Parliamentary Union Conference, Japan, 1974; Sri Lanka, 1975; Switzerland, 1984; Indian Delegation to the UN General Assembly, 1988, 1990, 1991, 1992, 1993 and 1994; Leader, Indian Delegation to the Human Rights Commission Conference, Geneva, 1993. Shri Vajpayee was conferred Padma Vibhushan in 1992 in recognition of his services to the nation. He was also conferred the Lokmanya Tilak Puruskar and the Bharat Ratna Pt. Govind Ballabh Pant Award for the Best Parliamentarian, both in 1994. Earlier, the Kanpur University honoured him with an Honorary Doctorate of Philosophy in 1993. Well known and respected for his love for poetry and as an eloquent speaker, Shri Vajpayee is known to be a voracious reader. He is fond of Indian music and dance.